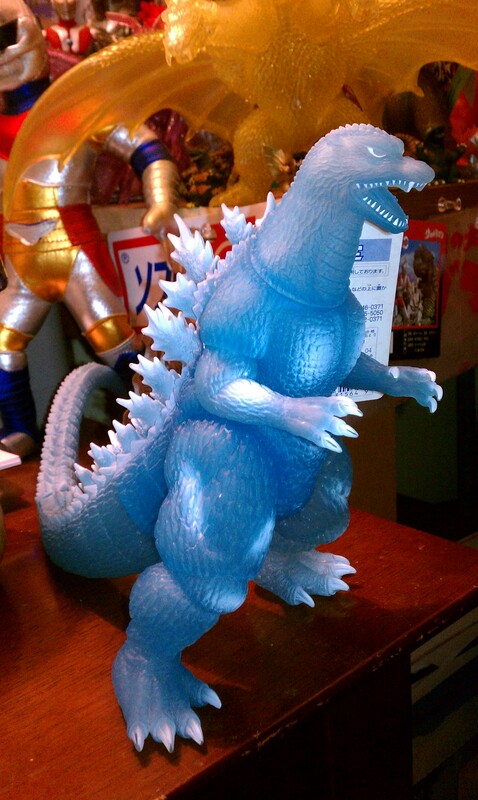 Bandai 8″ Ice Blue Godzilla: Final Wars Theater Exclusive (2004) – SKREEONK! Oh yes. He’s a keeper. Bandai’s 8″ GFW Goji is by far one of their most accurate and appealing Godzilla sculpts. All the details are spot on, from the dorsal spines to the intricacy of the unique face. The pose is even above-par; this Godzilla is in attack position – as opposed to the usual idol standing. This sculpt gets a perfect score as far as Bandai’s 8″ scale is concerned. The clear ‘ice blue’ vinyl is striking and makes this exclusive an immediate stand out. I’m a sucker for Godzilla figures in any shade of blue – but this easily one of Bandai’s best theater figures they’ve ever produced. The only paint that exists comes in the form of frost white – located in the usual spots. Sprays of white on the chest, legs, and individually whitened eyes and teeth add for an excellent effect. These figures pop up on the market rather often, but are never terribly cheap – making them a decently rare theater exclusive. This particular version of the GFW Goji theater exclusives is a bit more common than the full “Ice White” version, so don’t get the two confused. The blue version featured here usually sells in the $40 to $50 range. Don’t pay any more than $55 for this figure, wait it out and you’ll find one at a decent price. They’ve circuited pretty regularly on the market for a while now. Absolutely. This is one of Bandai’s most appealing Theater Exclusives ever, and makes an excellent counterpart to the 8″ GXMG White/Electric Blue Godzilla. Next Post X-PLUS to Release New Rodan & Mechagodzilla, Jet Jaguar and Godzilla now on Sale! Previous Post Garamon and Gigan from Marusan! Its a Collector’s Update!